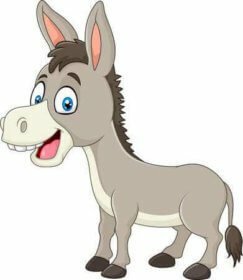 Post a Gotdonkeys Classified Ad for Free. Beautiful jennet foal sired by Country Music’s Garth Brooks. Country Music’s Kimmie Rhodes, only hours old, born 2/10/19 Brown/Black, 19” at birth. This beautiful jennet foal is sired by our Country Music’s Garth Brooks. He has sired innumerable Champions at Halter. (check our website on them). Kimmie’s grandsire is our Country Music’s George Jones, National Champion at Halter. Kimmie’s dam is Country Music’s Tammy Cockran. Her four generation pedigree is filled with outstanding donkeys: Somedays Cadillac Jack,Somedays Papa’s Money, Somedays Cinderella, ZMoBetta, Little Motown, and many more. She is in the process of being imprinted at this time. See www.minidonk.com to see this amazing jennet foal maneuvering the obstacle course at TWO WEEKS OLD! We welcome your visit to see her. Country Music's Chet Atkins D.OB. 4/10/19 color: Brown Ht. at birth 19 1/2" This handsome little jack is a grandson of our National Champion Halter Jack, Country Music's George Jones. (30"/Brown/Black) Chet's sire is our Country Music's Garth Brooks. (30"/Brown/Black) The extensive list of Garth's offsprings show records can be found on our website: www.minidonk.com. Chet's dam is our lovely, TFD Minnie Molena (32 ½"/Brown). Molena has quite a fine pedigree going back to all three Generations being fully registered. Chet will have approximately 30 hours of individual training by the time he is weaned the end of August. We welcome your visit to see this outstanding little jack. A map to our ranch which is between Austin and Marble Falls, Texas, is on our website, www.minidonk.com. Mama and baby mini donkeys. Very sweet pair, though mama is a little skittish. Both love to be pet. I'm selling them for my elderly parents. The donkeys have become to much for them to handle. Mama is under 35" Mama and baby must be bought together with the assurance that you will let the baby wean naturally. One price of $1400 for both. 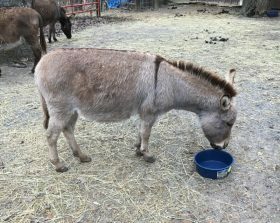 Weanling Female Miniature Donkey for Sale This listing is marked as sold. Adeline was black in her foal coat. She hasn't shed out of her winter hair and it has faded. Some black hair on her nose and around her hooves. She is correct in her legs and bite. Her pedigree includes Black Russian, Spotted Russian, Drs Chaboom & Donovan, Texas Red, Red Lightning, Little Motown, and several Merry-Go-Round donkeys. She is weaned, imprinted and gentle. Velvet was black as coal in foal coat. Over the winter she has grown a long coat of winter hair. She is still black where she has shed off. She is correct in her legs and bite. Her pedigree includes not only Merry-Go-Round's stock, blue eyed ivories, Windcrest, Short Assets, Arrow Creek, TTW, B.J. 's, and Cobra's stock as well. Susan was black in her foal coat and her winter hair has faded. Her adult color is black shown on her face and around her hooves. Her pedigree includes Merry-Go-Round's stock, blue eyed ivorys, Windcrest, Short Assets, Arrow Creek, TTW, B.J. 's, Dewey Meadows, and Cobra's. She is correct in her bite and legs. Ace of Spades is a fine young black jack. He is correct in his mouth and legs. His pedigree includes not only Merry-Go-Round's stock, Windcrest, Short Assets, Arrow Creek, TTW, B.J. 's, Circle C, Sunset Acres, Dewey Meadows, and Cobra's stock as well. Two miniature donkey foals due this summer! Dam1 : SMMD, Rotta #65546, 32 1/2in Red jennet Dam2 : SMMD, Rae #65547, 34in Dark Brown jennet Sire of both foals : Luv Me Tender Chili Pepper 31 1/4in Red jack Sire of jennets : Brayers Are Us, Bravo #42204 32 3/4 Dark brown jack Both of these foals will have excellent pedigrees and are registered with the NMDA. Both will be show or breeding quality. They make great family pets as well. For sale at 6000.00 as a pair. We will be accepting deposits of 25% for holding the foals due this summer. If you are interested, we will provide pictures of Sire and Dams upon request. We will post pictures of foals when they are born if they are not sold already. Tabora: (purple halter) DOB 6-5-2018 Gender: Jenny Color: Black/Brown with cross Size: 27 1/4" Stelleto: (red halter) DOB 8-5-2018 Gender: Jenny Color: Super Black with NLP, foal coat still visible Height: 28" Beautiful dark colored jennies to be sold as a pair: $2,200 each! Minook- Gray Jack for breeding or pet! My old mini donkey passed away and my young mini jenny needs a friend. Please not an old one as they need to be life long friends. Not going to be shown or anything other than a pet. Prefer a jenny or gelded male. Must be able to handle feet and grooming and good around my grand children. My little girl is named Jellybean and is very friendly and loving, would like one similar to her. Cant afford a ton of money but will travel some to get the right one to be a life long friend...I already have end of life arraignments for my little girl and any other that would be her friend as they live so long. First Prize is black with NLP. He is healthy and well imprinted. He was born 09/07/2017 and his height on 03/28/2019 is 27.25". His pedigree includes Black Russian, Little Motown, Russian Czar, B. J. Black Beauty, Rockbridge Maracas, and many more well known donkeys, many of them black. First Prize is weaned, micro chipped, and ready to be adopted. He is so well imprinted he follows me like a pet dog. We have several jennies for sale for pets - both newly retired and a couple of pets. Will only sell to pet homes - no breeding. Sweet girls - none older than 13. March special - please check out our website. 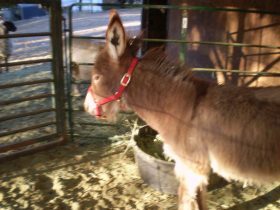 Light colored miniature donkey, less than 10 yrs old, jennet or jack. For France We have Poitou donkeys and work with the hair. Thanks for offers. ASSphalt Acres in Indiana is offering our Champion Show Gelding ASSphalt Acres Firechief for sale to anyone who wants to continue his show career. Firechief has been very successful in the ring being chosen as Best of Breed at The Great Celebration as well as winning both Excellence and Supreme Honor awards from the American Donkey ASSociation. There has been only a handful awarded the Supreme Award as it takes 35 or more points to achieve. Firechief would be an excellent gelding for young children to learn with, as our 5 yr old grandson has shown him by himself in the past. Contact Steve for more info. Apple Pie is a coming 18 yr old in June and is 34" long hair. She is bred for a May/June foal. She is bred to Dynamite a 31.75" black long hair. This will be her 3rd foal sired by this jack. 1 black jack/gelding and 1 gorgeous spotted jenny. Apple Pied is from Mcroberts and has Ark Park Apple Dumpling, GP Peanut, and Valintino 50 on her papers. Dynamite has L.U.A Maxx's Little Buckaroo, McLendon's 45 Magnum and MJB Jack of Spades. Located in southern CA. Willing to work with transporters. We have come up with a new weakling halter. Fits those newly weaned foals going to there nee home. Spring special- buy four and get the fifth one free. You can mix and match any size. Foal, weanling, small, medium , large and ex-large. We offer a large choice of colors. This site is Dedicated to the People who Love and Raise Miniature Donkeys.